News from the automotive performance aftermarket has the Inglese company recently acquired by Comp Cams. 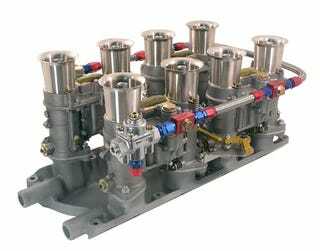 Jim Inglese has been building hi-performance Weber carburetion setups for American V-8 mills since the early eighties using Weber downdraft and sidedraft carburetors, and will continue to produce turn-key and custom systems for everything from Buick V-6 bangers to big block Chevies. Hot rodders, kit car builders and those wishing to freshen up or replace the induction systems on their Shelby 289 Cobras or DeTomaso Mangustas are still in good shape. We'll take a DeTomaso Pantera with a Ford 351 Cleveland packing an Inglese setup with eight angled intake trumpets for maximum sonic amusement.